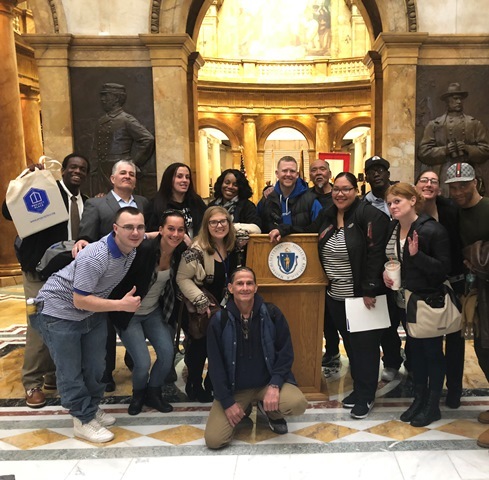 On February 28, more than twenty students in Project Place’s Work-Ready Class went to the State House to make their voices heard as part of an effort organized by the Coalition for Homeless Individuals (CHI). Nearly a third of the state’s homeless population are individuals, and that number is growing while state funding has remained at relatively the same level. Project Place is proud to be a member of the coalition and facilitate opportunities for our students to share their concerns with elected officials. CHI started the morning by holding a legislative breakfast focused on the issues and needs of the provider system charged with responding to homelessness among individuals across the state. The coalition specifically asked legislators to support, “A $4.23 million increase in unrestricted funds to the Homeless Individuals line-item (7004-0102), raising the funding level to $50 million, and inclusion of language that will ensure that the full funding increase reaches our providers” in the FY19 budget. After the program, Work-Ready students visited the offices of their respective representatives and shared their personal stories. One student spoke to an aide who said that the student’s story would help her senator pass positive legislation. “It was the first time that my voice was really accountable for something,” the student shared with Project Place staff.